I love it and this is how I will wear it. This is only my second lace project and the first time working from a chart, I did love knitting it, even the nupps, when I got used to knitting them a bit loose, thanks for the tip Mary. 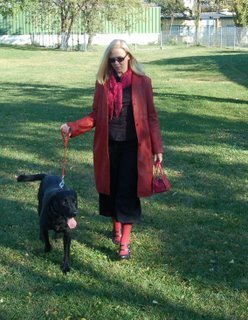 No, this is not how I usually look to walk the dog! My usual choice of photographer was a asleep as its tradition to spend the last day of the holidays in bed, so I had to make do with Jim, so apologies, this is the best! I love the Jumper on the cover of the Fall Interweave knits but am having trouble finding wool that I get gauge in, any suggestions? i bought a skein of the seasilk when i was in london in august…now you are making me want to cast on for the shawl immediately. That is beautiful! Congratulations! And congrats on your new blog as well! Oh, Yvette, it’s gorgeous! Congratulations — a very fine job. And I don’t care… I’m always going to think of you walking your dog that way — it’s a great picture! Just beautiful! You must be very pleased. I love your swallowtail, it’s just gorgeous. I have a skein of the seasilk in green that I have been wondering what to make with. 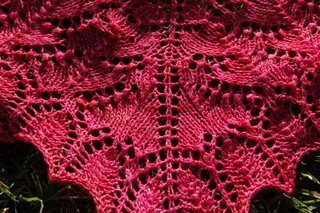 Funnily enough, Jacqueline suggested the swallowtail shawl to me last night, now I know where she got her inspiriation from! What a gorgeous job you did on your swallowtail! 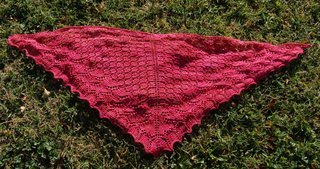 I am looking forward to giving seasilk yarn a try now after seeing your shawl!